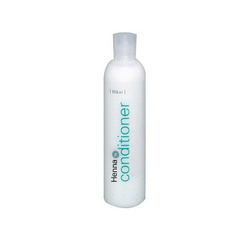 Henna conditioner acts naturally on hair to condition and add extra shine. This 100% natural conditioner contains natural henna and no harmful chemicals. It will not affect the color of the hair and only add extra shine, texture. Henna conditioner will increase the volume of the hair and helps you maintaining the bounce and balance of your hair. - Rich hair nourishing blend of Henna & neem to bring joy & luster to hair. Makes your hair smooth and shiny. Enriched with Shikakai, Henna, Indian Spikenard or Jojoba oil for smooth and glossy hair. This 100% natural conditioner contains natural henna and no harmful chemicals. It will not affect the color of the hair and only add extra shine, texture. - Available in 200 gm pack. Background: Henna Shine conditioning shampoo is specially developed to suit all hair type. Henna, a unique natural conditioner adds life to dull hair and makes hair strong and healthy. A professional product specially designed for very frizzy and dry hair to give a natural highlighted silky soft hair without the use of shampoo. Apply on the shaft and place a plastic cap over and leave it for 20 mins and rinse with lukewarm water. Pure Henna With Conditioner is a traditional hair colourant, pure high grade Henna (Lasonia Alba) has been finely powdered and mixed with Bhangra (Wedelis Chinensis) and other essential herbs to give your hair a natural rich colour combination of copper and burgundy. Adds luster and is a rich natural conditioner.